Kerala Chief Minister Pinarayi Vijayan said the state now faces an "extremely grave" crisis with downpours predicted to last days more. The state, famous for palm-lined beaches at resorts such as Bekal and tea plantations, is always battered by the annual monsoon but this year's damage has been the worst in almost a century. State authorities said 21 more deaths had been confirmed on Thursday taking the official toll to 86. Media reports said up to 30 more people were feared dead in landslides and rivers that burst their banks, flooding scores of villages. 19659003] At least eight people were killed when an irrigation dam burst and landslide hit three houses in the town of Nenmara, Palakkad district, authorities said. Mr Vijayan said 80 dams have reached danger levels and appealed to the population to not ignore evacuation orders. 1 9659003] Army and coastguard helicopters, lifeboats and navy diving teams have been brought to the stricken state where an extra 540 troops were deployed Thursday. More are due in coming days. The army said helicopters carried out scores of rescue operations. They also dropped food and water and appealed for the victims to stand in open fields or on rooftops away from trees so helicopters were not damaged during rescue efforts. More than 60,000 people have already sought refuge in relief camps. 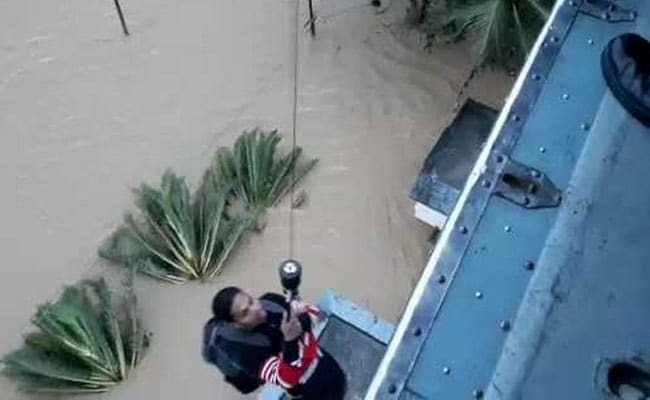 least 6,500 people are stranded in different parts of Kerala and the situation in three districts is particularly grim, "a state disaster management official told AFP. The government says 10,000 kilometers (6,000 miles) of Kerala roads have been destroyed or damaged and hundreds of homes lost. "Over 36 people including myself and family stranded here. "Anyone reading this, PLZ HELP." "Anyone reading this, PLZ HELP. My parents are stuck on the upper floor of a house with an 8 month pregnant lady, in Edayaranmula, Pathanamthitta dist. All rescue control rooms' numbers busy. No rescue team reached yet. North and Central Kerala has been hit by floods but all 14 of the state's districts have been put on "red alert" as heavy rain is predicted for several days. 19659003] In Kochi, the international airport will remain closed until August 26th, authorities said. Prime Minister Narendra Modi said on Thursday that he has ordered the defense ministry "to further step up the rescue and relief operations across the state."